18 Facts You May Not Know About Martin Luther King, Jr.
"King is the only American citizen, who was not a president, to have a national holiday in his honor." You may be hard-pressed to find a grade-school textbook without the name Reverend Dr. Martin Luther King Jr. in it, and you probably watched the classic movie "Our Friend, Martin" as a kid. He's most likely the first Civil Rights movement figure you learned about, and the one who is still highlighted more than any other today. However, no matter how much has been taught (or repeated), there are still some lesser known facts about Dr. King and his legacy. 1. Reverend Dr. Martin Luther King, Jr. was actually born Michael Luther King, Jr. He later changed his name when he became a minister. 2. King attempted suicide at the age of 12 by jumping from a second-story window in his family's home. On the evening that King attended a parade against his parents' wishes, his grandmother passed away after suffering from a fatal heart attack. King blamed himself for her death, after his little brother, whom he was supposed to be watching, knocked their grandmother unconscious while sliding down a banister. His grandmother's subsequent fall had nothing to do with her passing, but the guilt left Martin distraught for days. 3. At the 1939 Atlanta premiere of Gone With the Wind, King participated in the festivities as part of an all-boys choir out of Ebenezer Baptist Church. Ironically, two of the stars of the movie, Butterfly McQueen and Hattie McDaniel, who would go on to win an Oscar for her role as Mammy, were not invited. 4. In the summer of 1944, at the age of 15, King and a group of Morehouse students traveled to Simsbury, Conn. to work on a tobacco farm. The students were paid for their work and were able to spend the summer in the North in a non-segregated society, which played a significant role in King's early development. King would go on to say about the experience, "After that summer in Connecticut, it was a bitter feeling going back to segregation. It was hard to understand why I could ride wherever I pleased on the train from New York to Washington and then had to change to a Jim Crow [racially restricted] car at the nation's capital in order to continue the trip to Atlanta." He returned in the summer of 1947. 5. King entered Morehouse College at the age of 15 in 1944 and graduated with a degree in sociology at the age of 19. 6. During his four years at Morehouse, King earned only one A, in a second semester Bible course during his junior year. Throughout undergrad, he made mostly B's and passed classes that were pass/fail. His only D also came during the second semester of his junior year, in intermediate French. 7. King received his doctorate in systematic theology from Boston University in 1955. His dissertation was "A Comparison of God in the Thinking of Paul Tillich and Henry Wiseman." 8. In 1958, while at a book signing, Dr. King was stabbed by a mentally ill woman. He harbored no resentment towards his attacker and didn't press any charges against her. 10. In 1964, at the age of 35, King was the youngest recipient of the Nobel Peace Prize. Malala Yousafzai was 17 when she later won in 2014. 11. King is a Grammy winner. He posthumously won in 1971 for Best Spoken Word Album for "Why I Oppose the War in Vietnam." The speech from which the album was made was delivered April 30, 1967, at Riverside Church in New York City. 12. The peaceful preacher, applied for a gun permit to protect his family. 13. King was a pool shark and in an effort to reach as many people as possible, he often met with people in pool halls and beat them at the game. 14. 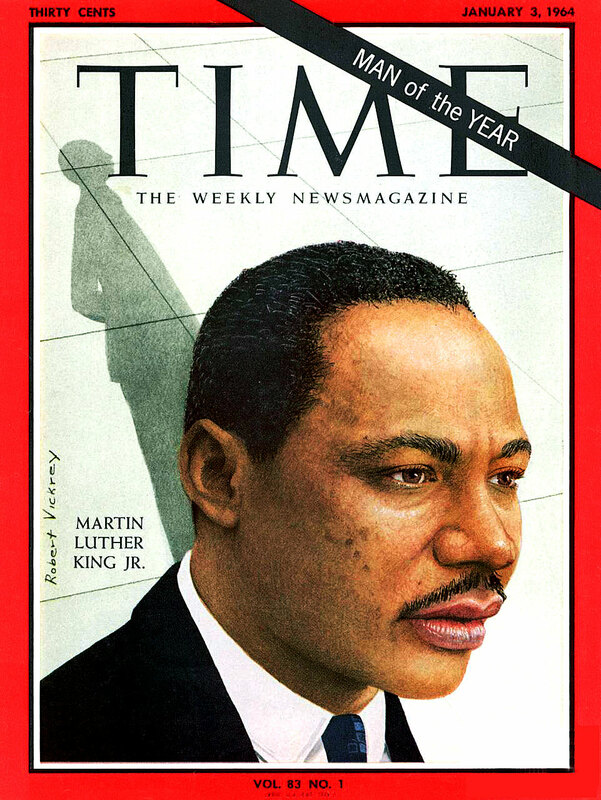 King became the first African-American to be named TIME Magazine’s Man of the Year in 1963. The only other African-American honoree is President Barack Obama. 15. King was arrested 29 times for his civil rights activities. 16. King's autopsy revealed that though he was only 39 when he died, he had the heart of a 60-year-old man, assumedly stress-related. 17. Across the United States, there are more than 900 places in 40 states with streets named after King. A larger portion of places, 70 percent, are located in Southern states, with Georgia leading the way with 122. 18. King is the only American citizen, who was not a president, to have a national holiday in his honor. May Martin's legacy of service to all mankind continue to be fulfilled as we celebrate his life this MLK day. Stay in peace, Dr. King.